The Monte Toboggans, not for wimps! 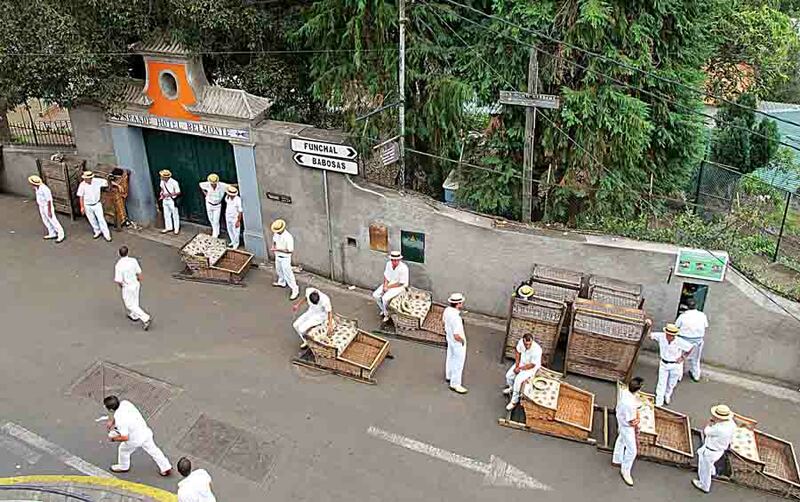 Madeira’s tree sleighs, toboggans, are almost as famous as the gondolas in Venice. You could not have visited the beautiful Atlantic island without having been joined by a sleigh ride from Monte and a few miles down the steep hills and alleys towards Funchal. 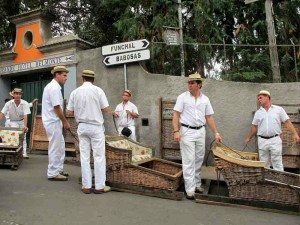 The crafts are known as «The Monte toboggans» and it revolves around a wicker chair a sled with runners that are managed by two men – legally equipped, ie uniformed with white shirts and trousers, straw hats and special shoes. 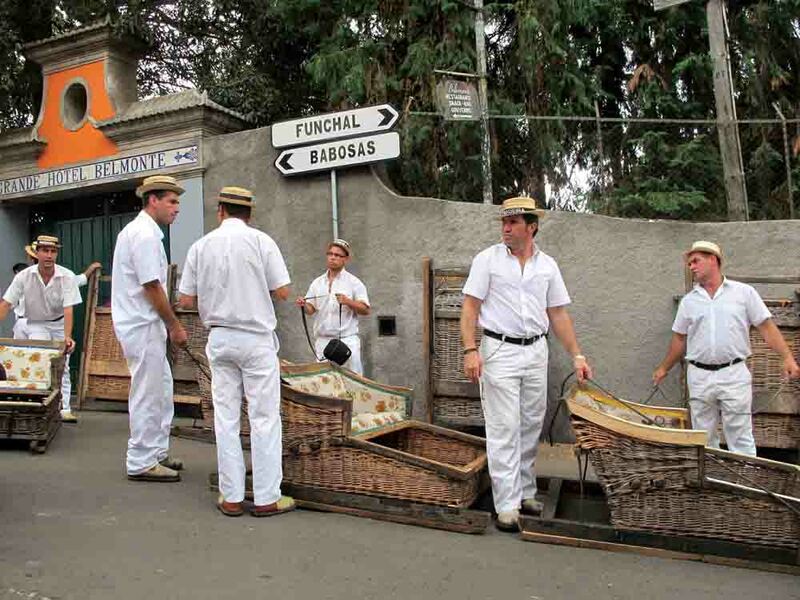 For it is quite a responsibility they undertake, the toboggan «drivers» hurtling down with tourists the steep slopes of Monte. Here it goes, and in some places it pops up even other vehicles, cars, motorcycles, taxis … The tourists, it is for that purpose the device is intended, are totally at the mercy of the uniformed expertise and their ability to manage the peculiar craft. That’s as far as we are clear of walls, ditches and fenders, and the toboggan drivers seem to have a clear idea – not to mention considerable expertise with how the luge sled is to be maneuvered. A great experience (without any safety devices, helmet, etc)! Monte toboggans were introduced in 1846 and is still good business that employs many madeirans. It costs around 20 euros per trip depending on how many people that shall be transported on each tour. If you are two in one sleigh it is cheaper than riding alone. Toboggans have never been used for anything else than tourist transport. This is purely a tourist attraction, a «must» visiting Funchal where the establishment is located. The sledges are transported back up to over 500 m with a truck. So the crafts are ready for new trips. New hoarse blows downwards trips with excited tourists who love asphalt sleigh without horse and snow …. At Monte there is a beautiful chapel which I will present later. Moreover, a botanical garden and various summer houses – plus regular homes. Originally, it was the high society that lived here, including in their palatial «quintas». One can get to Monte by cableway, bus or taxi. You can also walk, but there is a little way up. Taxis are not expensive. It is possible to agree on the price in advance. We received many offers and paid 12 euros for the taxi up the mountain. To Monte they once had a train running. The funicular kept going from 1893 to 1943 when people left the business. 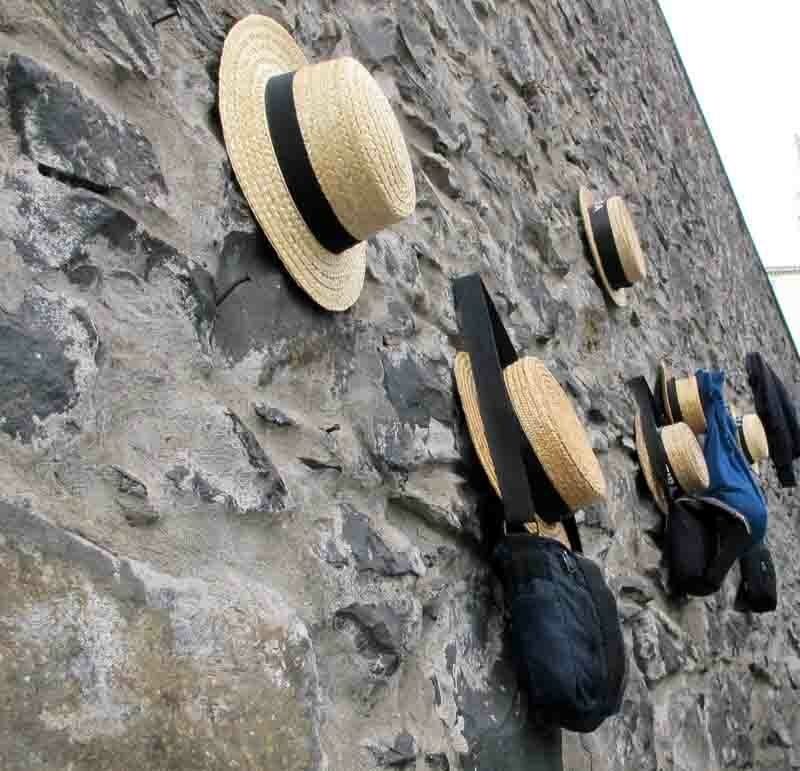 If you do not want to use the Apostles horses, there are plenty of taxis in the area. Also here there is a good time to haggle over the price. Drivers however are quite intense and aggressive, they will happily serve up some Euros. Although we chose a young driver with an old Mercedes with brand new brakes. We were happy for the brand new brakes, because the driver drived very fast down the steep and narrow alleys. We were terrified passengers. The taxi whizzed off a frenzied pace, a wild journey that got the sleigh ride to manifest almost as a Sunday trip.